← 7 Quick Takes: computer problems, pineapple upside down cake, and a triple take! The May challenge at Avid Baker’s Challenge is the King Arthur Flour English Digestive biscuits. These were super quick to knock together. The hardest part was waiting for the butter to come to room temperature. 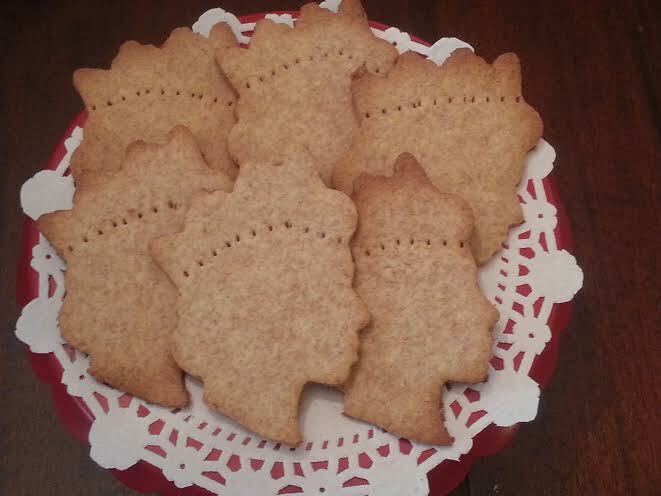 I also used this occasion to bust out my Queen Elizabeth silhouette cookie cutter that I bought from Fancy Flours. I was less successful with the thickness of the cookies. Some were closer to 1/4 inch than 1/8 inch. If I make these again I would stick to the thicker, 1/4 inch cookie. I didn’t quite get the baking time down pat either. Some were much crispier than others. I preferred the less crispy, thicker version. Overall they were good. A nice crumbly texture. I definitely think a cuppa would have improved them. I ate mine after it cooled without any liquid. The recipe can be found here along with a picture of what traditional digestives should look like. Measure the flour and baking powder into a mixing bowl. With a pastry blender, two knives, or your fingertips, rub the butter into the flour mixture. Toss in the sugar and enough milk to make a stiff dough. Knead this mixture on a floured surface until smooth. (All this can be done almost instantly in a food processor.) Roll the dough out to a bit more than 1/8 inch thick and cut into any desired shape. Traditionally, digestive biscuits are round and about 2 1/2 inches in diameter. Place on greased cookie sheets, prick evenly with a fork, and bake until pale gold, between 15 and 20 minutes. This entry was posted in Avid Baker's Challenge, Baking, English digestives, Fancy Flours, King Arthur Flour. Bookmark the permalink. It was really an easy cookie to put together. Nice job. Your cookie shape looks so beautiful. I preferred mine thicker too. Love your cookie cutter! Very appropriate! 🙂 Nice job! There’s probably some really ridiculous reason for pricking the surface. I’m reminded of the old joke about the cook who always cut off both ends of her roast before putting in the pan because her mother did and when finally asked about it the mother stated that she did that because her pan was too small. Yes! Well, we should all rebel and not prick! It was so easy to just hand mix the dough, very satisfying. Plus I didn’t have to clean up a food processor, just one bowl.